This unique Abiotic™ is used to stimulate native bacteria in the gut of the animal. Culbac® boosts daily health of your animal by improving appetite, average daily gain and overall performance. Safe for use with antibiotics and other medicated feeding programs. Less medication, better feed intake and more efficiency = cost savings for the producer Abiotics, not probiotics, Does not require a live culture to be fed. Long shelf life and require no refrigeration. 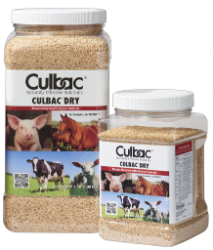 An Abiotic™ fermentation product for all livestock, Culbac® Dry, is derived by culturing Lactobacillus helveticus in a nutrient medium. Based on 6g delivery scoop. For maximum results feed daily. Top dress/mix over daily ration. Roughage Product, Dried Lactobacillus helveticus Fermentation Product, Lactic Acid. CAUTION: FOR LIVESTOCK USE ONLY! Do not use for purposes other than those described on this label or at any but the recommended levels.